The "Mother Road" has been open since 1926. Its heyday was the WWII and post-war era, with many roadside structures springing up to cater to the "tin-can tourists" making the journey from East to West. Gas stations, motels, and diners all had to compete for business and what better way to attract attention than with a wacky feature such as a wigwam motel, an iceberg cafe, or a whale-themed diner. 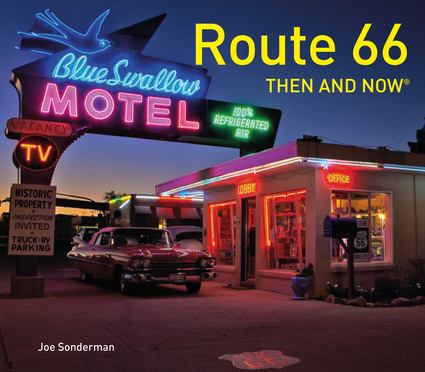 Route 66 Then and Now® revisits some of these bizarre (and not-so-bizarre) structures to see what's left before time takes its toll. Route 66 historian Joe Sonderman takes readers on the 2,500-mile trip, starting in Chicago, to the Blue Whale in Catoosa, past Angel Delgadillo's store in Seligman, Arizona, to the end point in Santa Monica. Joe Sonderman is a prolific Route 66 author and has one of the most extensive collections of Route 66 postcards in the US. He has written 13 books on the Mother Road, including Route 66 in Illinois, Missouri, St. Louis, Oklahoma, Kansas, New Mexico, Texas, and Arizona.